Up until the era of Julius Caesar, Rome lacked architectural tradition. Also, the architecture that did exist was of poor quality. Gradually things started to change under Caesar. He expanded the Forum Romanum in 54 B.C. However, his death put an end to renovations. What Caesar started architecturally, was continued on a greater scale under his nephew Augustus. Historians consider the architecture during the Augustan Age to be the finest in Roman history. It was the decision of Emperor Augustus to emulate Greek architectural designs. In addition, at this time Augustus began the extensive use of marble and Corinthian columns. The center of Rome life was the forum, a largely open space surrounded by basilicas. Basilicas were open air buildings that housed a temple and were supported by columns. The oldest and best known of the forums was the Forum Romanum. It served as the social center of Rome, housed the Senate, and was the chief economic center of the Roman Empire. It was also where the court rooms were located. Augustus constructed the greatest buildings that the empire had ever seen within the confines of the Forum Romanum. One of the Forum's most amazing buildings architecturally was the Basilica Julia which had been started by Julius Caesar in honor of his grandsons. The Basilica Julia stood opposite the Basilica Amelia, which is considered to be one of the most beautiful structures ever constructed in the Roman Empire. Before long, Augustus constructed his own Forum Augustum. 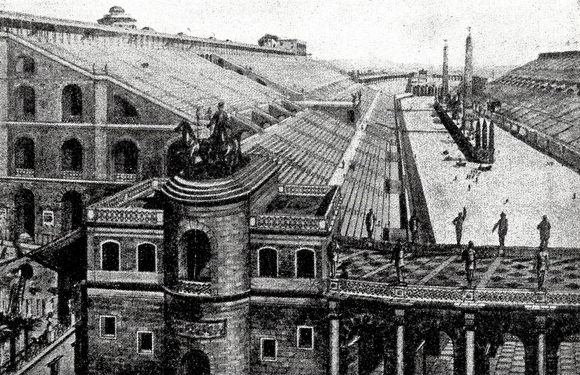 This long rectangular forum was first designed to be enclosed by one enormous temple. Augustus installed columns of marble along with statues to Venus, Aeneas, and Julius Caesar. Roman architecture would also flourish under Emperor Hadrian. Hadrian constructed great Roman architectural works throughout the empire. He constructed the Pantheon, and his amazing palace in Trivoli. Besides incredible architecture, the palace contained an amazing library, baths, and beautiful landscaping. Hadrian was a worldwide traveler and it influenced his architectural styles and achievements. The Roman architects made extensive use of Etruscan arches. Arches were constructed everywhere in the empire. They were used in the construction of theaters, the Roman Coliseum, bridges, aqueducts, and city gates. At the time, bridges were constructed by using a series of arches, and as a result, many are still in use today. In addition, arches, domes, and vaults were used extensively in the construction of the palaces. Triumphal arches that commemorated Romes greatest rulers were also popular. Arches dedicated to Augustus and Septimus Severus were very prominent in the Forum Romanum. Probably, the one invention that helped the Romans the most architecturally was the invention of concrete. They found that if they mixed volcanic dust with lime mortar they could produce cement that hardened. The Romans used the concrete for the core of there buildings because it wasn't very appealing. They covered the concrete in marble and clay bricks.